Irrigation & Sprinkler System Installers St. Louis, MO. Our irrigation specialists can install your sprinkler system. Are you looking for an irrigation or lawn sprinkler system to be installed on your property? A properly installed and setup irrigation system not only keeps your lawn and garden looking healthy and vibrant but it will also tightly control your water usage and distribution. 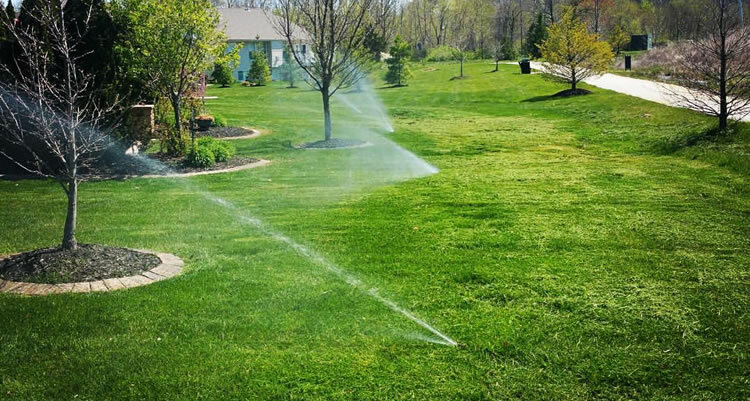 By maintaining tight control over your watering it actually saves you money on your water bill instead of trying to water your property by hand or using old-fashioned sprinklers connected to a hose. Irreco LLC is a full service landscaping and irrigation company serving the St. Louis area. Irrigation installations are a common aspect of many of our larger landscaping projects including the installation of new lawns, gardens, and front and back yard landscapes. Whether it’s for a single family residential property, a town home, or a commercial property we can install irrigation and lawn sprinkler systems of any size. Irrigation systems have been used by civilized society for thousands of years which has given us a lot of time to refine and improve the way we do things. Modern day irrigation systems don’t just deliver water where it’s needed most, they save water too because of the precise distribution control. This means the water is tightly controlled and distributed so less water is wasted! Without giving a deep explanation, your irrigation system will save you on your water expense because it’s strategically placing the water on your lawn or garden using a computerized controller that routes the water through the appropriate zones and distributes it using special sprinkler heads. A properly installed irrigation system will be able to evenly distribute the water for maximum effect. A properly setup sprinkler system will water your lawn and garden more efficiently without wasting water on places it’s not needed such as hardscaped surfaces like a driveway, sidewalk or patio. Special sprinkler heads can be used to distribute the water exactly where it’s needed, without waste. Our goals when installing an irrigation system on a customers property are making sure we’re distributing the water efficiently to the specific zones that require it. We also make sure the system is designed to operate trouble free and will be easy to maintain for our customer in the future. Do you have an existing irrigation system in place already that is old, inadequate, or not functioning properly? This is one of the reasons it’s important you choose an irrigation company that employs certified irrigation technicians. There are a number of un-qualified irrigation companies providing irrigation services to customers in St. Louis but when the contractor decides to cut corners you don’t know about (because it’s underground and you can’t see it) it’s going to cost you money down the road. It’s not cheap to dig up and repair a poorly installed system. Whether you manage a busy townhome or condo complex in need of an irrigation system or you have a private residence where you’d like a system installed and maintained we’ll be able to provide you with a great irrigation solution that will meet your needs perfectly. Why Choose Irreco For Your Irrigation Services? When you choose Irreco for your irrigation services you’re partnering with a small team of talented (and certified) individuals who really care about your property and their local reputation. Your new irrigation or lawn sprinkler system will be installed using modern and high-quality components that offer the best water efficiency and long, low-maintenance service life. If you would you like to schedule an estimate for a new irrigation installation please give us a call (314) 246-0099 or fill out our contact form and someone will be getting back to you shortly to schedule your appointment.